Patricia Snyder is the David Lawrence Jr. Endowed Chair in Early Childhood Studies and Director of the Center for Excellence in Early Childhood Studies at the University of Florida. She has more than 35 years’ experience in early intervention and early childhood as a direct service provider, program administrator, faculty member, and researcher. She is former editor of the Journal of Early Intervention and is an associate editor for Topics in Early Childhood Special Education. Her research focuses on embedded instruction for early learning, young children’s social-emotional competence, professional development, and measurement of early childhood outcomes. She has been a principal investigator or co-principal investigator for a number of funded research and technical assistance projects focused on these research emphasis areas. Dr. Snyder has authored more than 85 articles and book chapters, has served on the editorial boards for seven professional journals, and presented more than 400 seminars, workshops, and presentations at state, national, and international conferences. She served two terms as a principal member of the early intervention and early learning in special education review panel for the Institute of Education Sciences, is a member of the Division for Early Childhood Recommended Practices Commission, and has received numerous awards for her research, teaching, and service contributions to the field, including the Mary E. McEvoy Service to the Field and Merle B. Karnes Service to the Division awards from the Division for Early Childhood of the Council for Exceptional Children. If your program is using the evidence-based Pyramid Model for Promoting Social Emotional Competence in Infants and Young Children, this is the one tool you need to make sure teachers are effectively putting it into practice. The TPOT™ is an in-depth tool that measures how well teachers are implementing practices related to universal, targeted, and individualized supports. 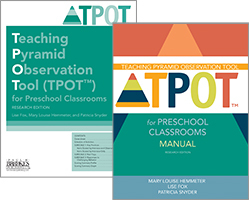 Set includes 1 manual for supervisors, and 5 research edition containing forms needed to conduct the TPOT™ for Preschool Classrooms observational assessment.